Though the Grecians may be in some temporary [we hope] financial trouble the ground has in the last few years been redeveloped on two sides, spending some ?700,000 plus (which has probably led to the current financial problems). Having traveled around the lower leagues and the conference in the last few years the Grecians ground is probably not the worst by a long way. And with a new capacity of some 10,500 it could possibly end up being one of the best. Exit the M5 at junction 30, and then follow the signs for Middlemoor. Take the second exit at Middlemoor roundabout (signed Heavitree). Follow signs for City Centre, going through Heavitree (approx. 2 miles). Past the police station on your right, then at the bottom of the hill turn right at the roundabout into Western Way (signed Pinhoe and Broadclyst). At the next roundabout, take the second exit, and then at the top of the hill (Old Tiverton Road) first left into St. James' Road. Take the A30 into Exeter. As you pass under the M5 bridge, this road becomes the B3183. Follow the signs for City Centre then follow the directions for 'From M5'. Follow the A30 into Exeter, joining the M5 North at junction 31. Leave at junction 30 and then follow the directions for 'From M5'. Arrive at Exeter Bus Station in Paris Street. Leave the bus station at the right hand end (beyond bay 18). Turn left, walk up the hill, then turn right at the lights into Sidwell Street. Walk up Sidwell Street, take the first exit at the roundabout, then first left into St. James' Road. 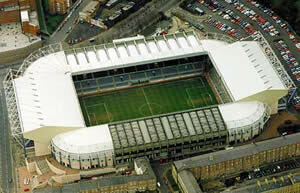 The ground is served by St James Park station, which is right beside the ground. This is on the line from Exeter St David's (main line station) and Exeter Central (City Centre) to Exmouth. If you are a registered user then you can login, and create your own personal review of Exeter City Football Club - St James' Park. These reviews can be private or public.